Paint the craft sticks, one each in red, orange, purple and yellow. Use the handle end of a large paintbrush dipped in light green paint to add large spots to the orange stick. Use a medium paintbrush to add smaller dots. Use a liner brush to add green stripes to the yellow stick. Use circular motion (as if you were drawing a circle with a crayon) with a large paintbrush handle to add the big eye to the purple stick. Depending on the size of the eyes that you want, use different sized paintbrushes. For the large eye on the purple stick, add a dot of green over the dry white paint and allow the green to dry. When dry, add a smaller dot of black. You can draw the mouths with a black marker and use a white paint pen, if you have one, to color in the teeth. I used a toothpick dipped in white paint. To add other details such as eyebrows use a fine point black marker. Hint: after making the teeth white, go over the outlines again with a black marker. Use a toothpick dipped in black paint to add the black pupils of the eyes. For larger pupils, use the handle of a paintbrush. 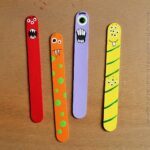 This project for Craft Stick Monsters was printed from CraftsbyAmanda.com - https://craftsbyamanda.com/monster-craft/ and can only be printed for education or personal use.